A place with a calm natural environment, Ilia is located in the western part of the Peloponnese, and it’s an ideal destination for relaxing holidays. Endless beaches with beautiful views of the sea and the sunset, plains with diverse cultures, scenic rivers and lakes, give the area its distinctive colour. Ancient Olympia, the birthplace of the Olympic Games with a worldwide reputation, the archaeological sites of Ilia and the Temple of Apollo Epicurius, attract the attention of visitors from around the world. The landscape of the county, complete the Mediterranean towns, the mountain villages, the seaside holiday villages, the harbours of Kyllini and Katakolon, and the hot springs of Caiaphas and Kyllini. Although, the beaches of the coast of Ilia stand out from the sites of this place. Cosmopolitan, organized or even isolated, these beaches can charm every visitor. Vartholomio is a town in the beautiful coast of Ilia, 34km away from the capital of the county, Pyrgos. It’s a place with greenhouses and farmlands, a modern agricultural town. In the surrounding area of ​​Vartholomio is the beach of Thines, a magnificent large sandy beach, and the coastal settlement Glyfa with a combination of rocky coasts and sandy beach. Glyfa is a really large beach with crystal blue and clean waters. Unique is the little port which is handmade by the members of the navy-sport club in the area. It’s not an organized beach but all around the area is full of hotels, rooms to let, restaurants and taverns, and shops for every need. 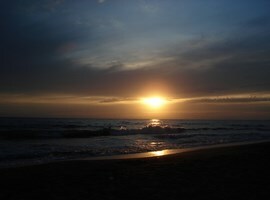 Zacharo is located on a low hill and is famous for its large sandy beach and the breathtaking view of the sunset. 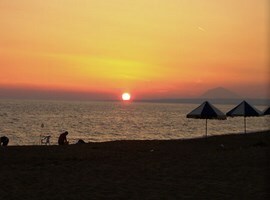 During the summer months is a town-destination for thousands of tourists, Greek and from abroad. In the area there is the remains of a Mycenaean arched tomb, for those who love the history and culture. The beach is just 800m away from the centre of the town. It’s one of the most beautiful beaches which someone can meet rarely not only in Greece, but in all over the world. The sea is crystal clear and the sand is spotless, fine and golden. The beach of Zacharo is awarded every year with the ‘’Blue Flag of Europe’’ which certifies the quality and the purity of the sea. It’s a fully organized beach and also offers opportunities for water sports activities. There is a wide variety of facilities to choose for accommodation, restaurants and eat houses, bars and cafes; for all the tastes, styles and budgets. Caiaphas is a beautiful village, just 26km away from Pyrgos. It’s an area famous already from the ancient years thanks to its hot springs. Also, its picturesque lake and its golden beach attract numerous tourists every year. The beach is very large, with white sand and open sea ideal for water sports like windsurfing. It’s not an organized one, however attracts many people. Close to the beach there are a lot of restaurants and coffee shops. The area is ideal for those who want to enjoy the walking and small hiking routes between the green lake landscape and the endless sea with the sand hills. Also, it’s great for biking, as the place offers rural next to the lake roads, with normal gradient. The lake of Kaiafas was formed by a large earthquake which took place in the 6th century AC. It’s a lively wetland which hosts fishes, snakes, eels, turtles, and a lot of emigrant bird species. The ecosystem of Kaiafas is considered to be the most pure and primal, unique in the entire world. 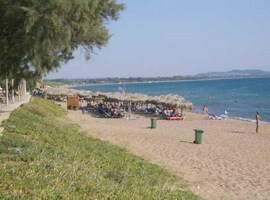 Kourouta is a resort-settlement on the famous beach of Kourouta. 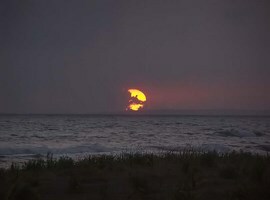 The popular Kourouta with the magical sunset and the good tourist facilities is an attraction for thousands visitors. Not far away is located the picturesque and small port of Palouki, area with fish-taverns, and home for the local fishing boats. 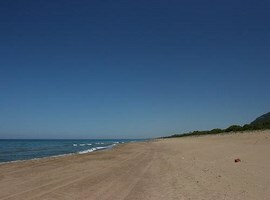 The beach is only 3km away from the second biggest city of the County, Amaliada. The sea is crystal clear and every year wins the European award of the Blue Flag. It’s a gorgeous beach, organized and full of young people, and is classified as one of the best of Greece. The countless coffee shops, bars, fish-taverns, hotels, rooms to let, and campings can make your staying here enjoyable and effortless as much as possible. 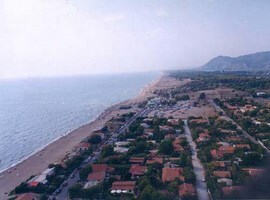 Kyllini is a town with a lively passenger and trade port which connect the Peloponnese with the islands of Zakynthos and Kefalonia. Also, the port is the home to many fishing boats which provide every day fresh fish to the local eat houses. Glarentza is an important castle town of the Medieval Greece, capital of the Principality of Achaea. It was an urban and financial centre, famous in the then known world. The excavations at the archaeological site of Glarentza have discovered architectural elements and sculptures, coins, ceramics, metallic and glass objects. In the village Castle of Kyllini is located a wonderful beach. It’s one of the most exotic and largest beaches of Peloponnese with crystal blue waters. The beach is organized and there is the ability for water sports. For the accommodation, there are a plenty of hotels and rooms to let and for entertainment many café, bars and taverns to have fun. 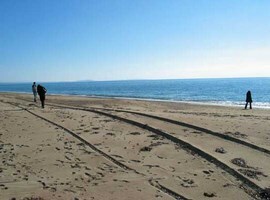 The hot springs of Kyllini are located between 2 lines of sand hills which create a valley with a direction to the sea. The area has a dense vegetation mainly of eucalyptus. Since 1998, in the area works a hydro-therapeutic building, and a lot of luxury hotels. The hot springs of Kyllini are famous already from the ancient years and thousands of visitors come here to cure many different diseases. The hot springs, the vapours and the mud can cure a variety of diseases such as arthritis, asthma, and many dermal diseases. During the vacations, someone can visit the remains of the Roman spa and to combine holidays with refreshment and treatment. It’s a settlement-resort with a remarkable tourist action. Close to the little port of Skafidia have been discovered some remains of ancient buildings. The view from this beach is just breath-taking. Someone can see the beauty of the Ionian Sea, the coasts and mountains of Zakynthos, and the impressive mass of the Ainos Mountain in Kefalonia. The sea is clean and pure with something special; on the rocky beach there is a spring of fresh water. 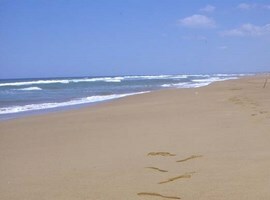 The beach is organized and is offered for water sport activities. Katakolo is a picturesque town with a style similar to the Ionian Islands. It has a lot of shops, café-bars, fish taverns and is an important tourist destination in Peloponnese. In the large port of Katakolo stop many cruise ships, every season of the world as the weather is almost good through the entire year. It is a wonderful beach which combines mountain and sea. The beach has golden sand, full of beautiful and colourful seashells. In the area, there are café-bars to enjoy a drink or a delicious coffee and also eat houses for all the tastes.